ConsultOnline | Budgets do matter in online consultation! Initially I included a section on cost efficiency in my series of blog posts on the principles of best practice in online consultation. Then I questioned whether cost efficiency was a feature of best practice. I determined that saving money in itself is not a measure by which to judge the success of a consultation. But budgets are not limitless and it would be naïve to assume that efficiencies do not feature in planning a consultation. Where the quality comes in, is in using resources appropriately. My experience is that online consultation can actually REDUCE the costs of a consultation, while also bringing about great results. Due to the ConsultOnline template approach, a four month programme together with the comprehensive website and promotion both on and off-line can be considerably cheaper than the cost of a dedicated website alone. 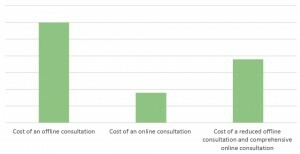 An online consultation is roughly ⅓ the cost of an offline consultation. A consultation which uses an online consultation package and ½ of the offline consultation that might have been used previously is just 48% the price of an offline-only consultation. Local authorities are always very positive about the way in which online consultation can increase engagement. So why not pay less and achieve more?